Surf or Sound Realty is located on Hatteras Island, part of the pristine Cape Hatteras National Seashore, on The Outer Banks of North Carolina. Since 1978, Surf or Sound Realty has offered weekly rentals of premier vacation rental homes from single family beach homes to multi bedroom oceanfront estates with a wide range of amenities. 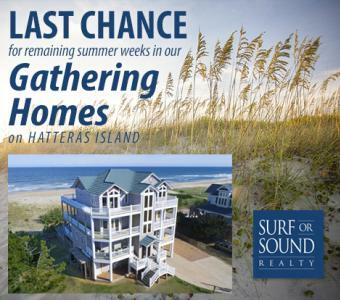 Find our homes from oceanfront to soundfront in all seven charming villages on Hatteras Island. Many of our wide portfolio of homes include private swimming pools, hot tubs, elevators, and theater rooms. Weekly rental rates vary depending on the season and the property. We have a large selection of dog friendly homes. Get married on an island! Have your wedding on the beach and host your event at one of our wedding and event homes. Speak with our Event Coordinator for more help choosing the perfect home for your beach wedding. We serve thousands of happy Outer Banks vacationers every year. Join us online!